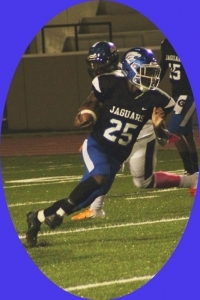 A 30-24 win over the Tucker Tigers on Friday night at Hallford Stadium gave the Stephenson Jaguars their first region title since 2015 and broke a three-game losing streak to Tigers in the Region 4-6A title game. After a fumble return by the Tigers gave Tucker (7-3, 7-1) a 7-0 lead early in the game, Stephenson’s Tra Wilkins scored on a 23-yard to start a 20-0 run by the Jaguars (9-1, 8-0) as they went up 20-7. Tucker came storming back on a 10-yard Tyler Hughey touchdown run and a three-yard touchdown pass from Travon Ford to David Davis with less than minute to play in the half led to a 21-20 Tiger lead heading into the break. The score remained 21-20 throughout the better part of the third quarter before Stephenson’s Dominic Allen connected on a 33-yard field goal to give the Jaguars the lead again at 23-20. A big 27-yard run on third and 28 by Jevon Goff set up the go-ahead kick. A big defensive stand on a three-and-out and the Jaguars put together a drive to stretch the lead to 9 when Donovan Moorer got loose up the middle and outraced the Tigers’ defenders 39 yards to the end zone. Allen’s kick made it 30-21 with 11 minutes to play. Tucker was only able to manage a 19-yard field goal by Kyle Wright with four minutes to play to make the final of 30-24. Stephenson was able to run out the clock to claim their ninth region title under Coach Ron Gartrell (229-118) who moved within one game of his 230th career victory in 31 seasons and 194-72 in 23 seasons as the only coach the Jaguars have had since the school opened. Stephenson takes on the 2017 Class 6A runner-up and Region 1-6A runner-up Coffee Trojans (7-3) in the first round of the state playoffs on Friday tentatively set for 7:30 pm at Hallford Stadium. Tucker also gets a home game on Friday night as they face Region 1-6A No. 3 seed Northside-Warner Robins for the fifth time in the state playoffs since 2007 and third consecutive season. The game is tentatively set for 7:30 pm at Adams Stadium on Friday. In other Region 4-6A action involving DeKalb teams, the Martin Luther King Lions (1-9) fourth quarter rally fell just short in a 19-13 loss to Morrow (3-7) on Saturday night at Godfrey Stadium. King trailed 19-0 heading into the fourth quarter and pulled within six with 2:51 to play before Morrow was able to run out the clock for the win. The Lions lost five games by 7 points or less this season. The No. 9 ranked Southwest DeKalb Panthers used its smothering defense to knock off DeKalb and Region 5-5A rival Columbia 13-6 to complete its season at 10-0 for the eighth time in school history. Three interceptions helped hold DeKalb’s leading passer Octavious Griffin to just 64 yards passing in the game with one of the interceptions being returned 57 yards for a touchdown by D’Won Mason. Aquil Muhammad accounted for the other Panthers’ score with a 90-yard punt return for the difference maker. It is the Panthers’ first 10-win season since 1999 under the guidance of Hall of Fame coach Buck Godfrey. Southwest DeKalb is set to host Region 8-5A No. 4 seed Loganville (4-6) on Friday. 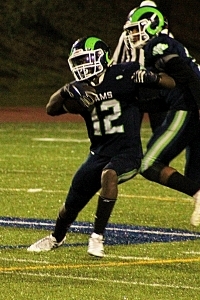 The Arabia Mountain Rams (6-4, 4-1) secured a home playoff game with a 37-0 shutout of the Lithonia Bulldogs (6-4, 3-2) at Adams Stadium on Friday night. Jordan Barrow kickstarted the win with an 80-yard kickoff return for a touchdown to open the game and sandwiched a 15-yard return of a blocked punt for a touchdown by Jamie Buckhanon with a 50-yard touchdown reception as the Rams jumped in front 20-0 in the first quarter. Malcom Grinnell, who scored 13 points on the night (4-5 PATs, touchdown and field goal), scored on a one-yard run with 10 minutes left in the first half as the Rams took a 27-0 lead into the half. Bryson Williams scored on a one-yard run with six minutes to go in the third quarter and Grinnell added the PAT for a 33-0 advantage before tacking on a 39-yard field goal two minutes later for the final of 37-0. Arabia gets to host a Class 5A playoff game for the third consecutive season as they take on Region 8-5A No. 3 seed Clarke Central (6-4). The date and site are to be announced. Lithonia will travel to Cedar Shoals (7-3), the Region 8 No. 2 seed, on Friday at 7:30 pm and Miller Grove (3-7), a 39-3 winner over Chamblee (0-10) last Friday, travels to take on Buford (8-2) at 7:30 pm on Friday. The No. 2 ranked Cedar Grove Saints (9-1, 6-0) finished off their second consecutive undefeated season in Region 5-3A action with a 71-0 win over the Stone Mountain Pirates (2-8) on Friday at Godfrey Stadium. Chavon Wright scored a pair of rushing touchdowns of 29 yards and 12 yards to lead the way for the Saints. Jadon Haselwood took a swing pass 69 yards to open the scoring. Cedar Grove will host Region 8 No. 4 seed Hart County (4-6) in the first round of the Class 3A state playoffs with a date and sited to be determined.